[Graphic News] What's on your holiday wish list? For the eleventh year in a row in US, gift cards remain the most popular items on wish lists, requested by 61 percent of those surveyed, followed by clothing and accessories at 55 percent, the highest level the category has seen in 12 years. 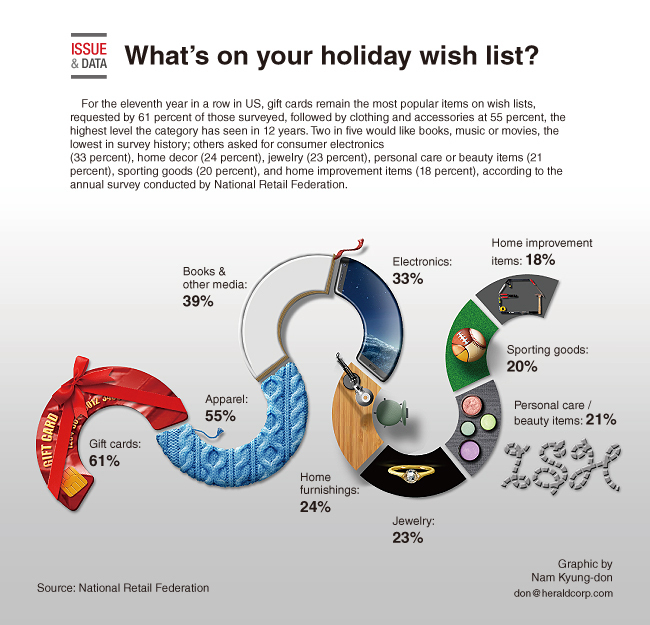 Two in five would like books, music or movies, the lowest in survey history; others asked for consumer electronics (33 percent), home decor (24 percent), jewelry (23 percent), personal care or beauty items (21 percent), sporting goods (20 percent), and home improvement items (18 percent), according to the annual survey conducted by National Retail Federation.